The Tables, Bryant Park’s state-of-the-art Ping Pong facility just north of the lawn, are not usually very busy in March, but the weather brought players and spectators to the area all month. We began an upgrade of the area a couple of weeks ago and moved the tables just off-site, and people kept right on playing. The upgrade’s done, and The Tables are now officially open. We’ve widened the entire area, enlarged the bluestone pads on which players perform, and arranged it all to achieve maximum mobility in, out, and through the area. We also added more space for seating. The Tables are open daily from 11:00am-7:00pm. Just see the attendant, who will schedule matches and dispense paddles and ball, the use of which are free. Also opening officially for the season this week is Pétanque, the French game of boules played at the west end of the park near the Fountain Terrace. The Pétanque court is administered by representatives from La Boule New Yorkaise, the city’s premier Pétanque club. These aficionados, who are on-site 11:00am-6:00pm, Mon-Fri, arrange matches, and also give free lessons. La Boule New Yorkaise also stages tournaments at the park through the spring and summer. Look on the club’s website and our own Calendar for tournament information. And coming soon to Bryant Park: Kubb, a Scandinavian game described as “Viking chess”, and “a combination of bowling and horseshoes.” We performed a dress rehearsal at the new Bryant Park Games Area, as described in this this entry at the BP blog, and we’ll soon be ready to go, so keep looking here, or at the blog, for developments. There’s more star power at Greeley Square Park this week, as TV super-chef Emeril Lagasse appears there on Wednesday, April 4, to promote his new line of cookware available at nearby JCPenney. This event, produced in coordination with the 34th Street Partnership, has a ‘Jazz Festival’ theme in honor of the upcoming annual music festival in New Orleans. After passing out samples of Big Easy-inspired goodies from a truck at the northern tip of the park beginning at 10:30am, Emeril moves to a transparent tent, where he’ll whip up some more tasty treats while using his product line. There’ll be free samples for everyone until the food runs out, or 1:00pm, whichever comes first. Visitors will also enjoy live New Orleans jazz, and Emeril will speak to 30 invited bloggers and members of the media as he prepares the food, ensuring that the name ‘Greeley Square’ is read and heard by many. This is just the latest high-profile promotion at Greeley Square. These events bring excitement to our public spaces and, just as important, bring in revenues that help us maintain them. If your company is interested in a product launch, promotion, or photo shoot at Herald or Greeley Squares, visit our website for complete instructions. The NYC Department of Transportation has begun its city-wide installation of 1,000 CityBenches, designed and developed by Ignacio Ciocchini. We noticed one outside the Port Authority Bus Terminal on 42nd Street between Eighth and Ninth Avenues, and we understand that dozens more will appear on NYC’s sidewalks in April. We’re pleased that the benches, originally created for use by the Chelsea Improvement Company, will soon provide needed seating for pedestrians and bus commuters in all five boroughs. To observe just how the CityBenches already installed in Chelsea and on 34th Street are being used, Sarah Xu, of the Operations department, recently took her camera to those areas and photographed people using them. The Department was satisfied that the benches accommodated many types of folks: elderly people, shoppers with packages, and families. The 24” wide seats give people of all sizes plenty of room to sprawl if they needed, or to keep adequate social space between sitters on a fully employed bench. Oh, and did we mention that they look great? Long before the founding of the Bryant Park Restoration Corporation on 1980, there was another major effort to reclaim the park for the people of New York City. The 1934 renovation of Bryant Park followed two of the most dramatic years in the park’s history. In 1932, Bryant Park’s fortunes were at low ebb, for many reasons. The park laid in the shadow of the “noisy, clanky, and utterly barbarous” Sixth Avenue El train, and was bordered by “newsstands that look like the shacks of squatters”, according to commenters in the New York Times. The nation was also in the midst of the Great Depression, which meant that there was little city money available to maintain the park. Administration of NYC’s parks was, at any rate, a haphazard affair: there was no Parks Commissioner, and each borough’s parks were administered by a separate official, who often was a patronage appointee with little expertise. Things looked pretty bleak, but deliverance was on the way. Throughout the early 1930’s, calls to save the park continued, and at least 100 plans to remodel and restore it were created by landscape architects and circulated. In late 1933, the Architects Emergency Committee, formed to provide relief for unemployed architects, held a contest calling for plans to renovate the park. That contest was won by Queens architect Lusby Simpson (pictured here), and all 40 entries were displayed at the Ziegfeld Theater in November, 1933. Simpson’s design would serve as the basis for a spectacular restoration, but a few things had to happen first - most importantly, the appointment of a true Parks Commissioner (Robert Moses) with the power, will, and energy to fight the inertia that seemed to have doomed the park to permanent dilapidation. 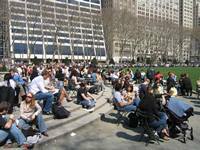 We’ve mentioned that the 20-year anniversary of the reopening of Bryant Park is approaching. Since that time, the park has become a four-season attraction, but we still thought that March was our one “slow” month. Park attendance through March 2012 makes us wonder about that, though. During the week of March 19-23, with no winter attractions, few warm-weather ones, and the lawn not open yet, we had lunchtime counts of 3,594, 3,381, 2,182, 4,869, and 4,225. That’s an average of 3,650. Back in 1992, figures like these would have pleased us at the height of summer.